Photo-Journal Guide to Marvel Comic Books Vol. 3 and 4 Group (Gerber Publishing, 1991) Condition: Average VF. 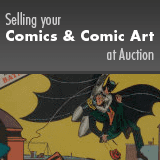 These two volumes cover Marvel comics from the Silver Age and up. Like-new copies, note that the minor rippling on the covers was present in the entire print run of these books.